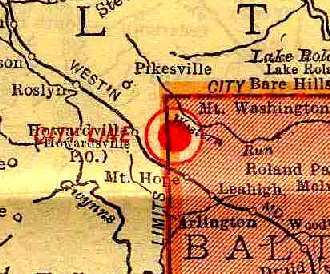 The City Line Airport, as depicted on the 1929 "Rand McNally Standard Map of MD with Air Trails" (courtesy of Chris Kennedy). and in very close proximity to the Park Heights Flying School Airfield (located less than 1 mile to the northwest). The date of establishment of the City Line Airport has not been determined. 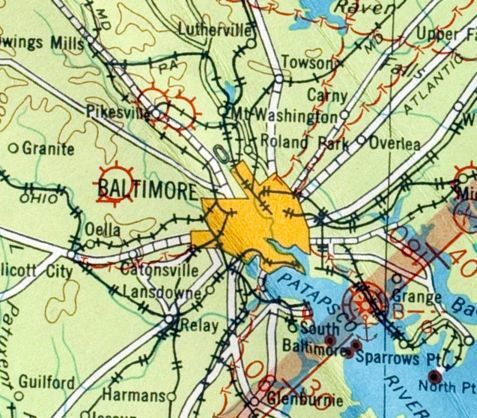 was on the 1929 "Rand McNally Standard Map of MD with Air Trails" (courtesy of Chris Kennedy). operated by the Aircraft Corporation of Maryland. City Line Airport, as depicted on the 1929 Washington to New York City Air Navigation Map #3.
subsequent aeronautical charts, or the 1943 or 1946 USGS topo maps. 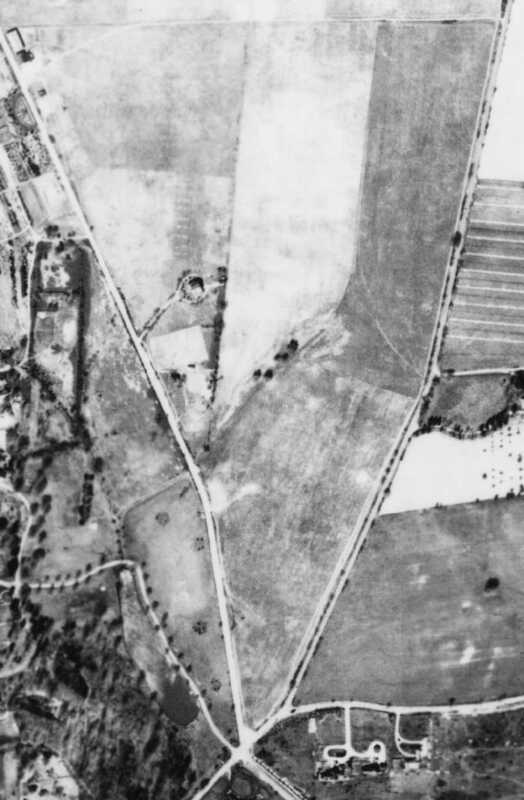 By the time of a 1957 aerial photo, not a trace appeared to remain of City Line Airport. the presumed location of City Line Airport has been covered by a school & dense residential development. 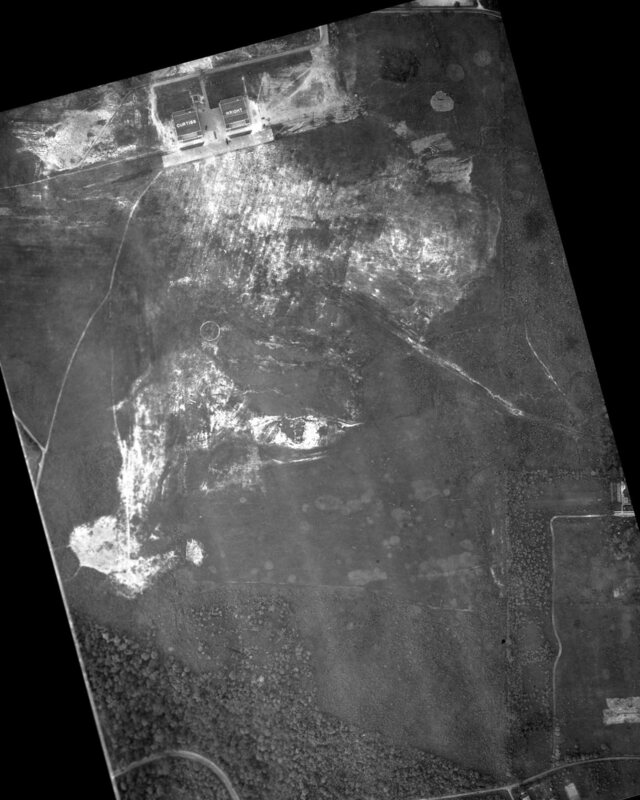 A 2015 aerial photo showed no trace remains of City Line Airport. roughly midway between Park Heights Avenue & Reisterstown Road. unknown, Louis Vollman, Warner Hull, Winfield Peck, George Hain, Mrs. Peck, and unknown. The date of establishment of this flying school airfield has not been determined. 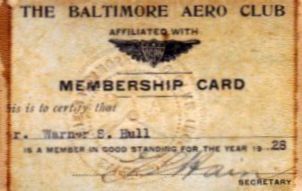 Warner Hull's 1928 membership card (courtesy of Mike Hull) from Park Heights' Baltimore Aero Club. It described the Park Heights Flying School Airfield as a 72-acre commercial airfield. Park Heights Flying School Airfield, as depicted on the 1929 Washington to New York City Air Navigation Map #3. According to the book "Maryland Aloft" by Preston, Lanman, and Breilhan, this field was also known as Service Field. A circa 1929-30 advertisement for Baltimore Airways Company described flights from Handler Field to Newark NJ. A circa 1930 Cram's street map (courtesy of Greg Stec) depicted “Handler Airport” at this location. as consisting of a single 2,000' x 300' grass runway, oriented northwest/southeast. with a single hangar located at the south end, along Park Heights Avenue. "Those landing on Park Heights Flying Field for the first time should use northern half of field. South of trees in center of field are knolls & depressions with which pilot should be familiar." 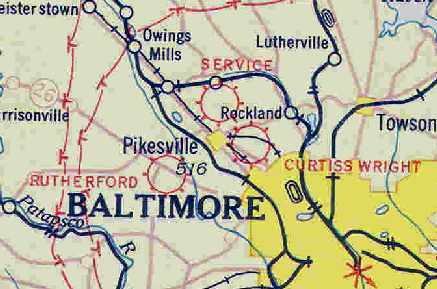 described “Service Field” as a commercial field located 6 miles northwest of Baltimore & 1 mile northwest of Curtiss-Wright Field. the longest being the 2,205' north/south strip. 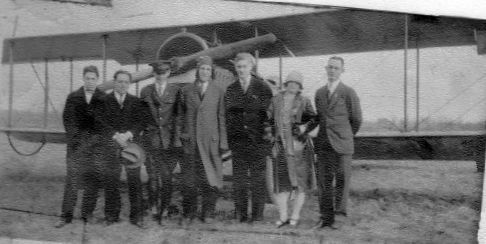 A 5/28/31 photo (courtesy of Mike Hull) of the members of Park Heights' Baltimore Aero Club. 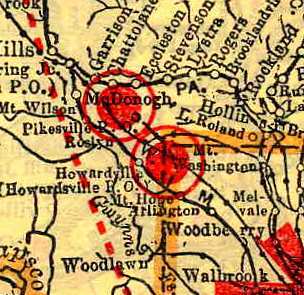 It was depicted as "Service" Field on the May 1932 J-18 Washington D. C. Airway Map (courtesy of Chris Kennedy). Ray Watson recalled, “In the early 1930s my father took me to all the airports in the area. I had my first lesson at Handler (Service) Field. 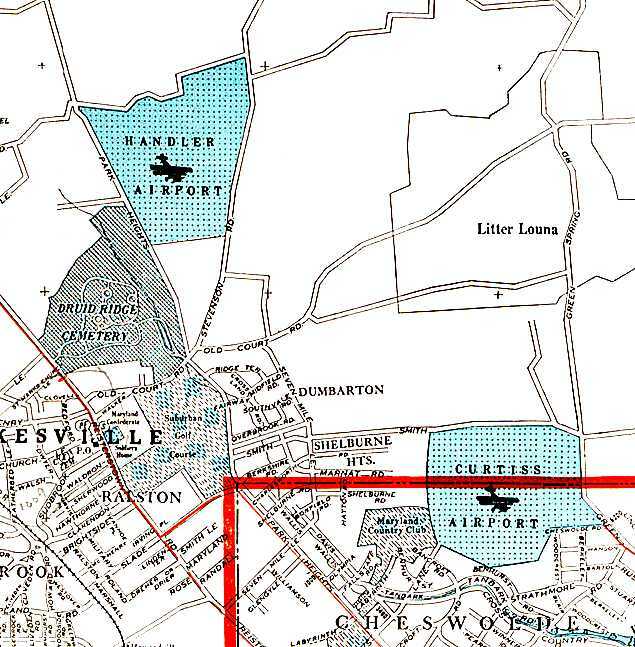 About 1933 only the south end of the area shown as Service Field was in operation. 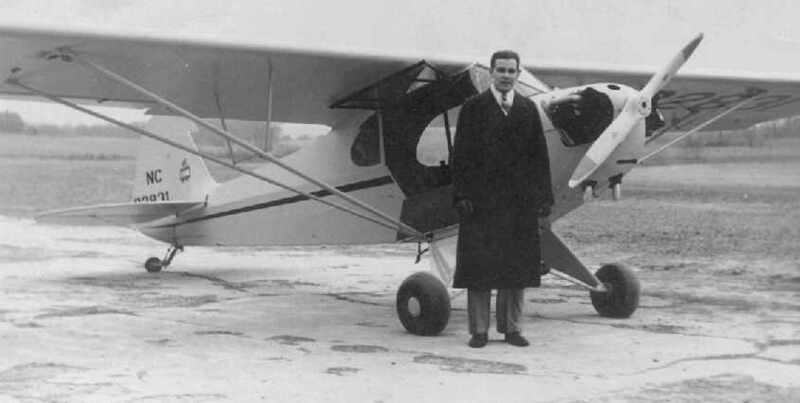 this photo showed Doug Ruthvan in front of his Waco at Service Field. 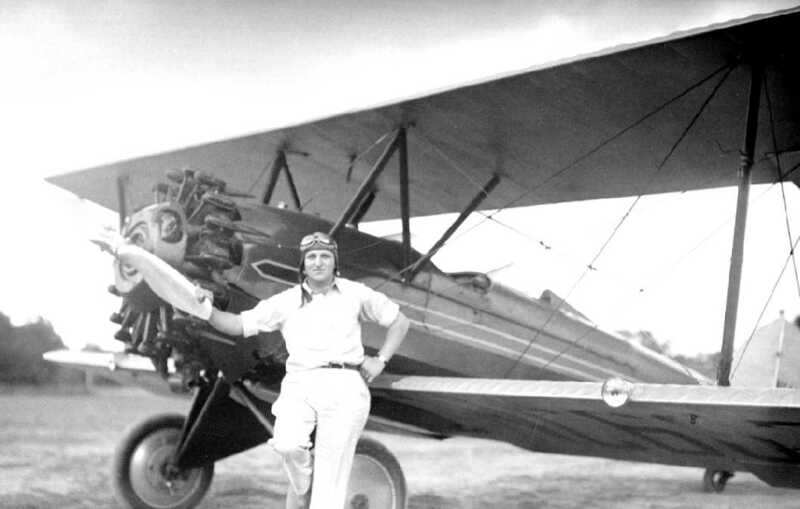 A circa 1933-34 photo by Ray Watson of an unidentified pilot in front of a German biplane (type undetermined) at Service Field. described “Service Field” as a commercial field located 1 mile northwest of Curtiss-Wright Field. 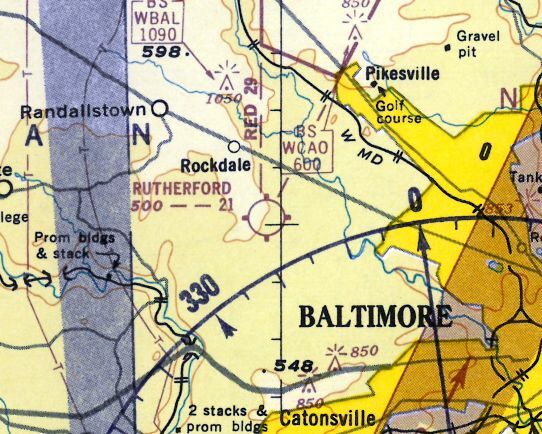 of the Park Heights Flying School was on the October 1934 Sectional Aeronautical Chart (according to the book "Maryland Aloft"). nor listed in the 1936 Commerce Department Descriptions of Airports & Landing Fields (courtesy of David Brooks). and the single hangar depicted on the 1930 diagram at the south end of the field was gone. Park Heights Flying School was no longer depicted at all on the 1943 or 1946 USGS topo maps. it had been covered by a housing development. and no trace appears to remain of the airfield. The site of The Park Heights Flying School is located on the north corner of Stevenson Road & Park Heights Avenue. 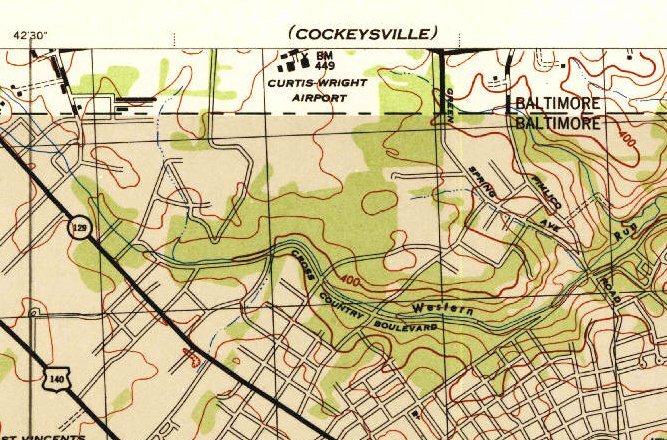 The Baltimore Beltway (695) runs along the northern border of the former airport site. The airfield area at Curtiss Airport, as depicted on a 1930 Commerce Department Airway Bulletin (courtesy of Michael McMurtrey). southwest of the intersection of Smith Avenue & Greenspring Avenue. Curtiss-Wright Airport began operations in 1929. The Curtiss-Wright company got the urge to build airports after Lindbergh created a stir in the public's mind with his Paris flight. Their field in Baltimore was one of a dozen the company built around the country. The hangars in particular were distinctively a Curtiss-Wright innovation. upon the field's completion, it replaced Logan Field as the primary base of the local Curtiss-Wright Flying Service. and it "offered instruction for pilots & mechanics, maintenance, flight services, and basing for private aircraft." the airfield consisted of a total of 260 acres, with a 4,000' x 4,000' irregularly-shaped grass landing area. Two 100' x 120' hangars sat at the north end of the field. and the operator was listed as Curtiss Airports Corporation. The Flying Club of Baltimore was listed as using the field. A circa 1930 Cram's street map (courtesy of Greg Stec) depicted “Curtiss Airport”. the longest being the 3,000' east/west strip. 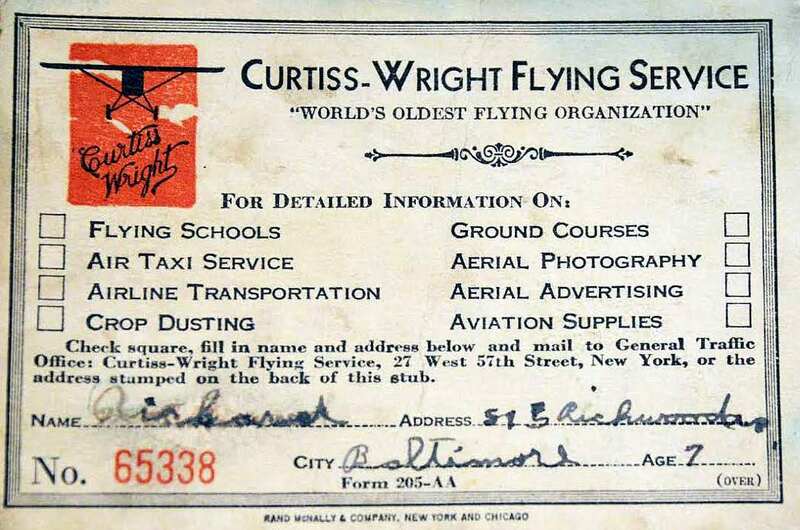 A 1931 ticket stub (courtesy of Richard Black) for his flight from Curtiss Wright Airport. and we always hoped someone would offer us a ride - which never happened. I had a stub for a plane ride ticket. For age was filled in '7'. I recall very little about what happened, except my mother had taken me to the airport, and for a plane ride. The airplane was a twin-engine biplane. There were seats on either side of the center aisle. Probably single row. The engine covers were held down by spring-handled catches such were used on automobiles at the time. Curtiss Wright Field, as depicted on the May 1932 J-18 Washington D. C. Airway Map (courtesy of Chris Kennedy). According to the book "Maryland Aloft", Curtiss-Wright Airport was "dominated by 2 imposing concrete-block hangars in the Art-Deco style. set in a single-story projection that was flanked by 2-story sections. Aerial shows at the field included members of the Thunderbird Flying Club, formed at the airport in 1933. Behind the excitement at Curtiss-Wright Airport was Colonel William Tipton, who leased & ran the facility during its heyday. and was also a flying club president & a columnist on aviation topics. and seems not to have been particularly profitable as a business venture." According to a Baltimore Sun article (via Wade Minami), there was an aerial meet sponsored by the Camber Club held at Curtiss-Wright on 6/3/34, and William Tipton was the event chairman. The field was located at Smith & Greenspring Avenues. 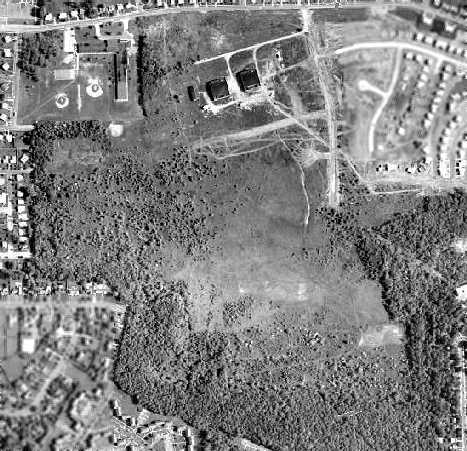 The earliest photo which has been located of Curtss-Wright Field was a 8/12/34 aerial view by the MD National Guard's 104th Observation Squadron (courtesy of Wade Minami). 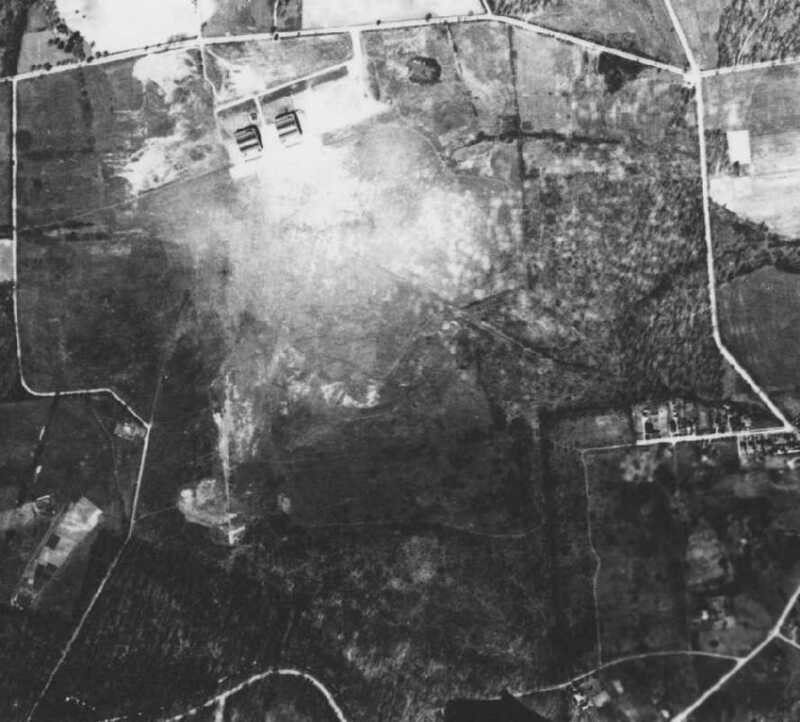 The airfield consisted of an irregularly-shaped grass area with an airport circle marking in the center. Two large hangars (painted with “Curtiss” & “Wright”) sat on the north side of the airfield, and 1 single-engine plane was parked on a paved ramp. 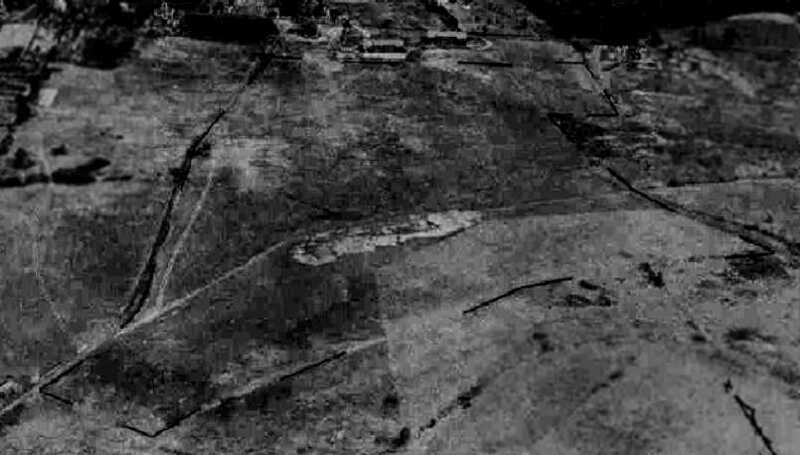 The 1/1/36 Department of Commerce Airway Bulletin described Curtiss-Wright Airport as a commercial field, consisting of a irregularly-shaped sod field. It was said to have a total of 4 runways, with the longest being the 3,000' east/west strip. A hangar was said to be marked with “Curtiss Wright Baltimore” on the roof. described Curtiss-Wright Field as having 3 grass landing strips, with the longest being 3,000'. 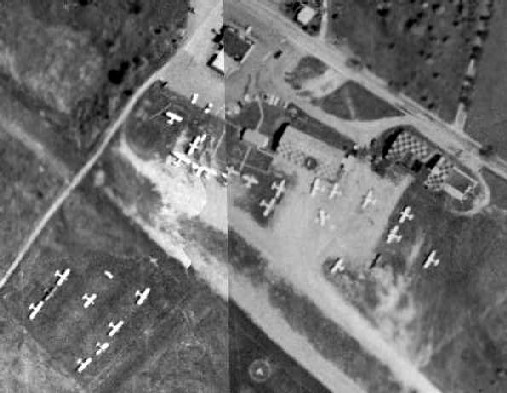 The aerial photo in the directory depicted 2 hangars on the field. 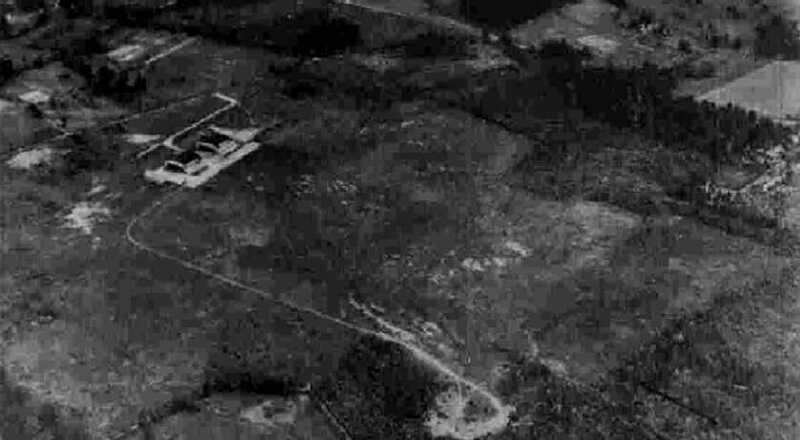 showing the grass airfield area & the 2 hangars on the north side of the airfield. Curtiss-Wright was Baltimore's largest private flying center by 1941. Both the field & its school, the Baltimore School of Aeronautics, were in charge of chief pilot Lester Sipe. At one point Curtiss-Wright had many yellow Piper or Taylorcraft Cubs on the flight line. According to Joe Handelman, “There was a Kreutzer Air Coach (most likely an K-5) Tri-Motor at the Curtiss-Wright Airport. An undated (circa 1940s?) 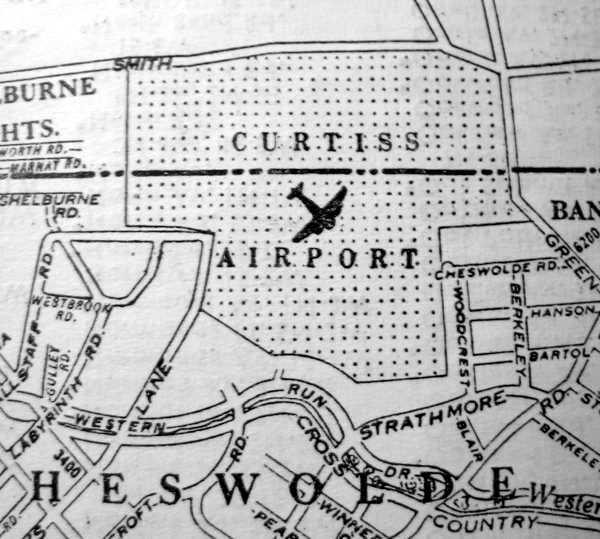 street map depicted “Curtiss Airport”. Curtiss-Wright Field may have been a Civil Air Patrol center during WW2. "Curtiss-Wright Airport closed, at least for civilian operations, during the war [WW2]." depicted the field as an open grass area with 2 hangars along the north side. within which was a sod all-way landing area measuring 3,000' x 2,100'. The field was said to have 2 hangars: 120' x 100' concrete & steel, and 100' x 50' wood & metal. 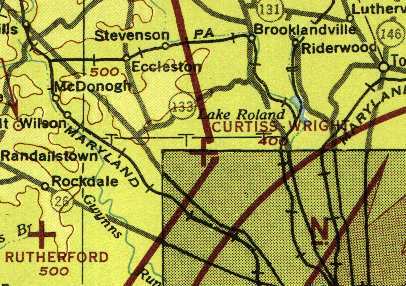 The 1944 USGS topo map depicted “Curtis-Wright Airport” as having 3 hangars, but did not depict any runways. Curtiss-Wright Airport was still depicted on the 1945 AAF Aeronautical Approach Chart (courtesy of Mike Keefe). and was operated by W. E. Mainville. Curtiss-Wright Airport was still depicted on 1946 Washington Sectional Chart (courtesy of Mike Keefe). According to the book "Maryland Aloft", in 1946 "the facility was renamed Pimlico Airport, and presumably changed owners at that time. 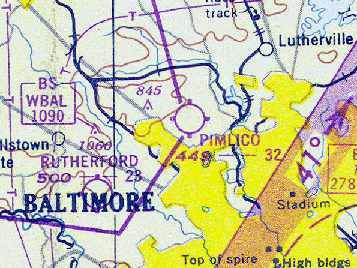 Pimlico Airport, as depicted on the 1946 USGS topo map. 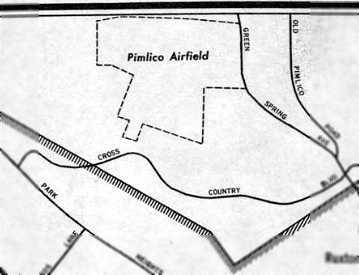 The outline of Pimlico Airfield, as depicted on a 1946 USGS map. 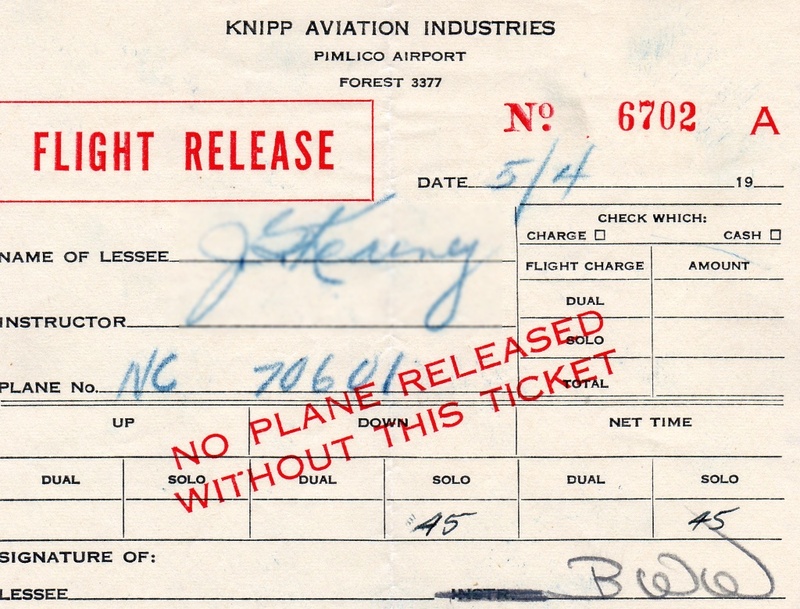 A 5/4/46 receipt for the rental of NC70601 from Pimlico Airport's Knip Aviation Industries (courtesy of Rick Vaeth). A 10/6/46 photo of pilot James Kearney next to a Piper J-3, with the Pimlico Airport tower visible in the background (courtesy of Rick Vaeth). 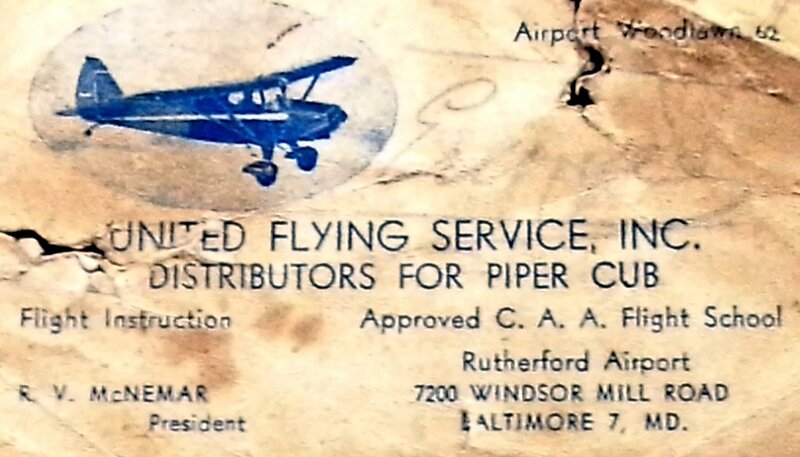 A 1947 MD Airport Directory listed Pimlico Airport's owner as Knipp Aviation Industries. as having a 3,200' unpaved runway. as it was no longer depicted at all on the 1949 Washington Sectional Chart (courtesy of Mike Keefe). An article in the 12/12/49 Harness Horse described an effort to build a harness horse racing track on the site of the former Pimlico Airport. in the Smith Avenue - Seven Mile Lane area of northern Baltimore. Some time after Pimlico Airport's closing, some war surplus aircraft were stored there. 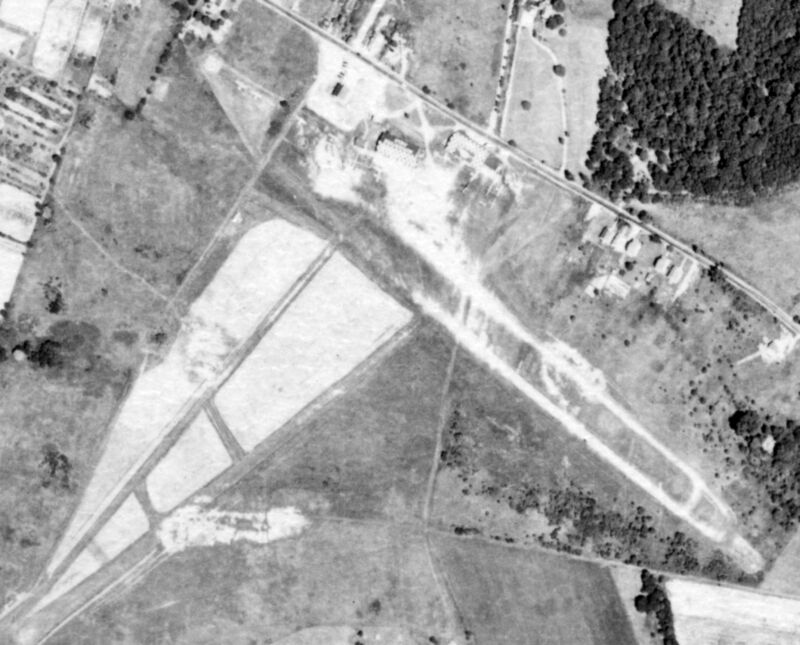 A silver B-18, possibly a B-23, possibly a B-17, and perhaps a Beech C-45 were parked at one point near the hangars. with 2 hangars on the north side of the field, and an open grass landing area. Note that the ramp on the airfield side of the hangars was covered with automobiles, instead of planes. 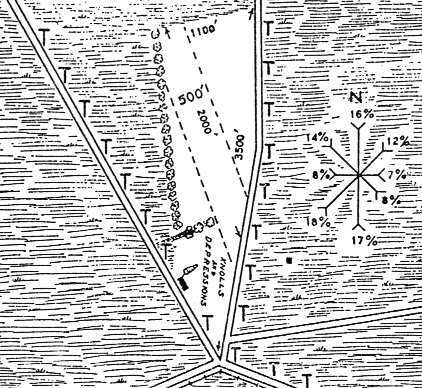 The 1953 USGS topo map depicted 3 hangars at the site of Curtiss Wright Airport, but did not label the property at all. A circa late 1950s aerial view looking west at Curtiss-Wright Airport. Similarly to the 1952 picture, the ramp was covered with a large number of automobiles. An oval track had been cut over the former airfield area. Some time later Bendix Aviation utilized Pimlico Airport for radar & electronics work, with radar antennae to be seen from Smith Avenue. 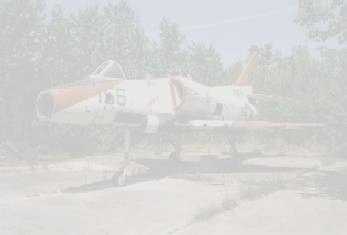 After Bendix left, the old airfield laid abandoned for some years. 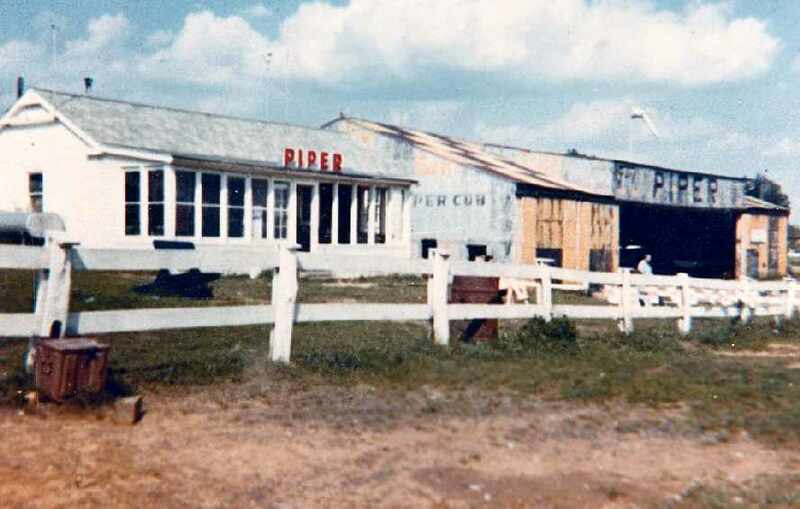 By 1958-1960, the place was a ghost town, with empty hangars. There was a large wall map of the world in what appeared to have been an operations room. According to Steve Scheinberg, who lived nearby, "I still remember playing in the empty concrete shells of the hangar. It had a big wing-looking thing over the entrance." however, the article pointed out that a retail complex was proposed for the property." 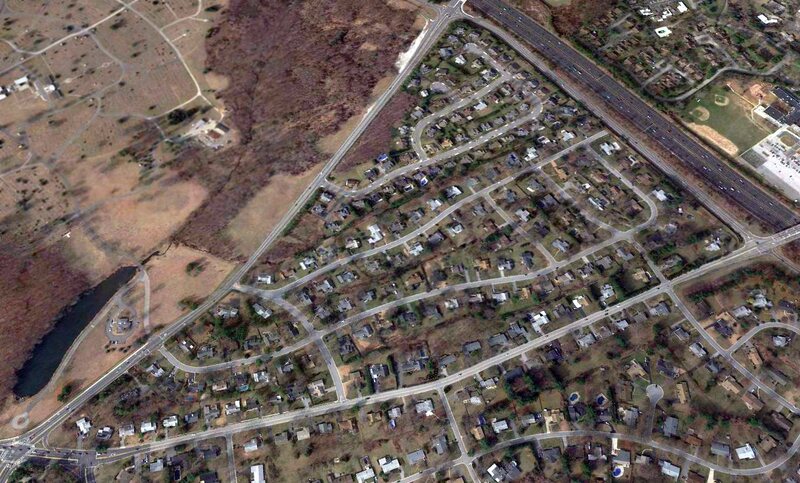 but housing had been built over a northeastern portion of the property. 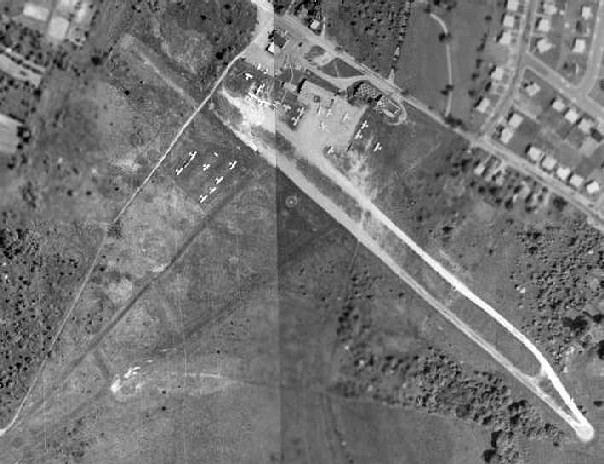 A closeup from the 1964 aerial view showing the 2 hangars remaining standing at the abandoned Pimlico Airport. the hangars had been removed, and construction was underway on the site of the Smith Avenue shopping center. However, some traces of the hangars might have been incorporated into the construction of the new shopping center. 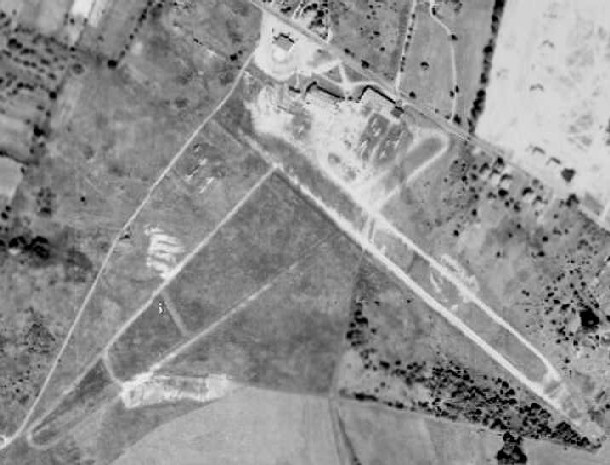 A 1993 aerial photo showed no trace remaining of Pimlico Airport. 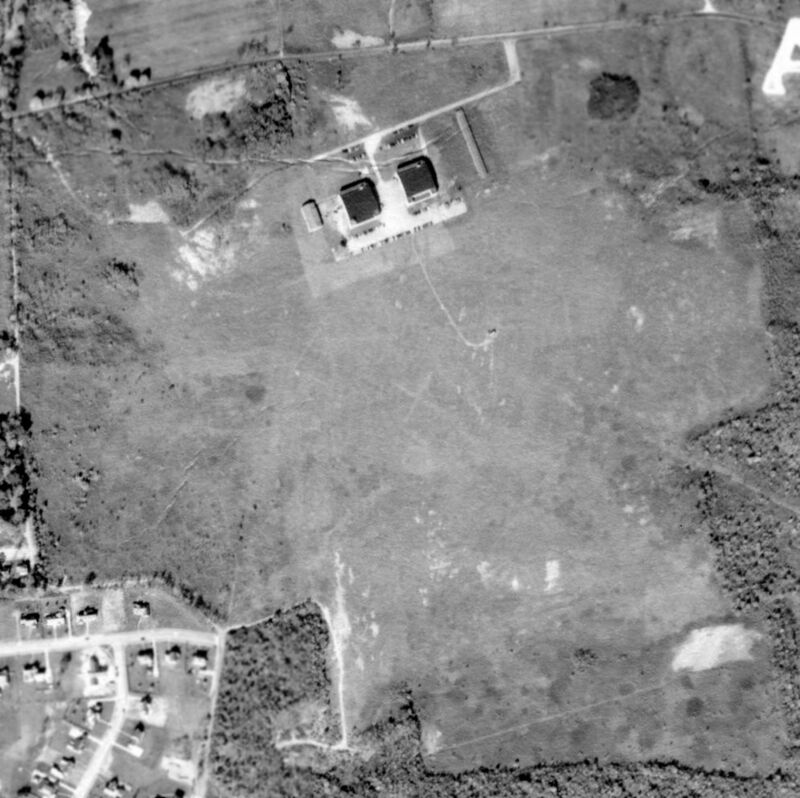 A 2017 aerial view of the site of Curtiss-Wright / Pimlico Airport, showing no remaining trace of the airfield. Thanks to Joe Handelman for providing details about Curtiss-Wright. Rutherford Field, as depicted on the 1929 Washington to New York City Air Navigation Map #3.
proprietor of a nearby gun & recreation club. Rutherford's company operated 3 aircraft & offered pilot training, rides, and aerial tours. and began operation on 5/1/30, according to the November 1941 issue of Baltimore Magazine. owned the land of Rutherford Field (or was the major stockholder in the corporation). 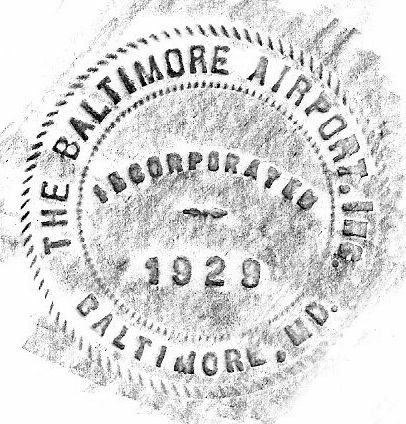 A 1929 seal for “The Baltimore Airport, Inc.” (courtesy of Kristin Shaffer, who found it as she was cleaning out her uncle's basement). My great-grandfather (Chester Jennings Sr.) was an investor in the Airport. My grandfather (Chester Jenning Jr.) owned a small plane after WWII,which he kept at the airport. A circa 1930 Cram's street map (courtesy of Greg Stec) depicted “Rutherford Flying Field”. described Rutherford Field as an irregularly-shaped 125-acre sod field measuring 2,250' x 1,875'. was on the May 1932 J-18 Washington D. C. Airway Map (courtesy of Chris Kennedy). however the hangar roof displayed a more modest designation, Rutherford Field." 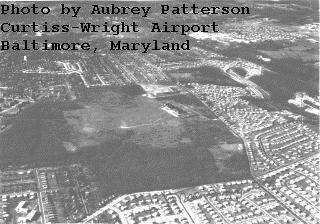 described "Baltimore Airport (Rutherford Field)" as having an irregularly-shaped 2,250' x 1,875' sod landing area. Ray Watson recalled, “I hung around Rutherford field after Service Field closed”, [circa 1934-35]. The directory described Rutherford Field as having a 100 acre all-way landing area. one of which had "Baltimore Airport" painted on the roof. consisting of an irregularly-shaped 100 acre sod field. Steve Hurtt was told "that Howard Hughes flew in to Rutherford in the 1930s with one of the prototype DC-1s." Charlie Macgill recalled, “Rutherford Field, where I made my first solo in 1940. I knew that it was meant to be that I should FLY! and met my hero, Bill Tyler, who was to be my instructor. Bill used to snap roll a J-3 Cub which was a no-no due to the possibility of the tail coming off... but it never did. One of the best acrobatic pilots who I have ever known... Eddy Waderman. depicted the field as an open grass area with hangars along the north side. 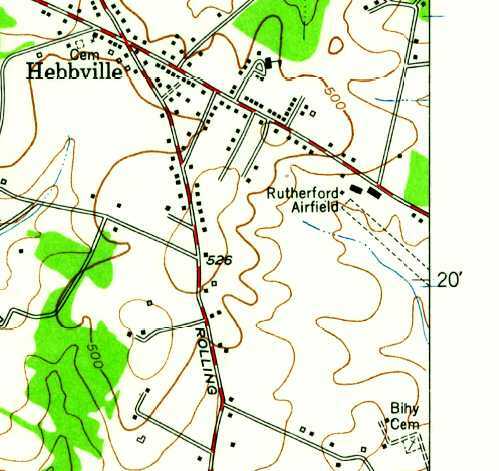 The 1944 USGS topo map labeled “Rutherford Air Field” but did not depict any other details. within which were 3 sod runways, with the longest being the 2,250' northeast/southwest strip. The field was said to have 2 hangars: 120' x 60' & 110' x 60', both being wood & steel. 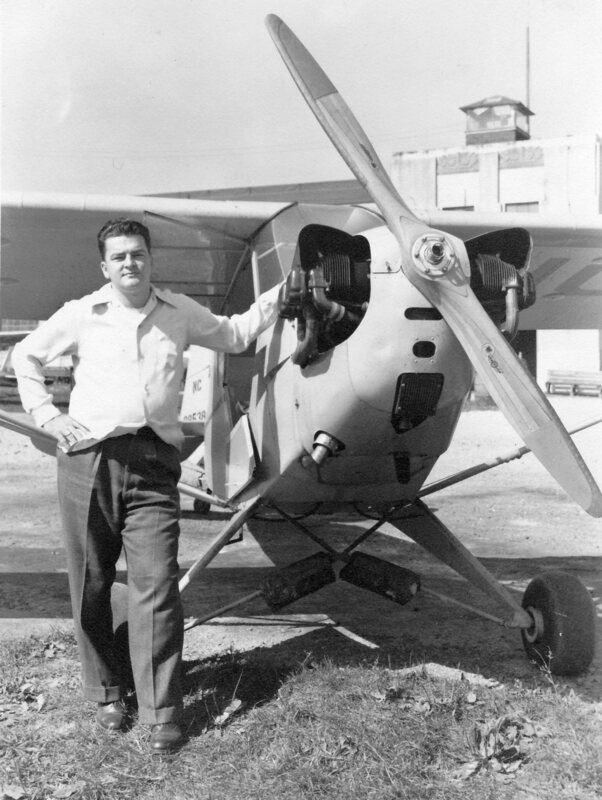 Howard L. Stevens, pictured in 1945 at Rutherford Field in front of a Piper Cub (courtesy of Howard Stevens). under the name of Stevens Flying Service. (Rutherford Field) which he had opened & operated when he was about 20 years old [circa 1938]." Howard L. Stevens later went on to establish & operate Stevens Airport, in Frederick. 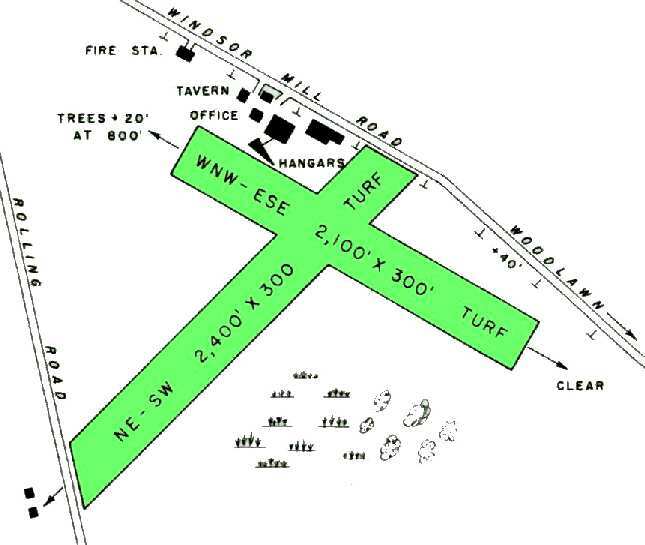 Rutherford Field, as depicted on the 1945 AAF Aeronautical Approach Chart (courtesy of Mike Keefe). The airport had 2 hangars & a building containing an office & a lounge. The manager was listed as Raymond McNemar. 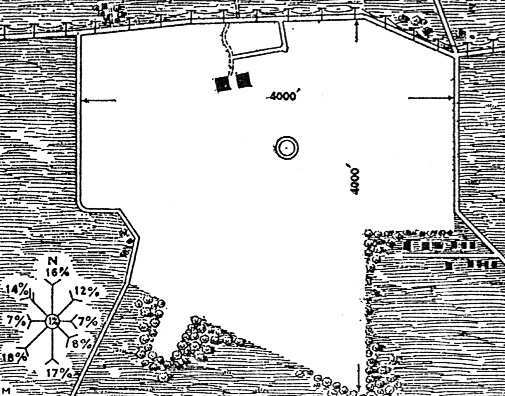 Rutherford Field, as depicted on the 1946 USGS topo map. Mrs. Mack at Rutherford did. as it looked much more like the runway than the real runway." the field was within walking distance when my dad & I took some very long walks. and soon thereafter for the Glenn L. Martin Company. Despite this, he was not that interested in flying. He & a friend had built a Heath Parasol that they sold to a teacher at McDonough School & the plane & pilot did not last that long. and spent most all my childhood playing in the fields & streams around the runways. and friends to most all the old flyers there. us kids salvaged a good supply of tobacco, booze, and naughty books that would have made our mothers faint. I was always sad to see such a wonderful airport go. served us kids as pointy medieval helmets. Our home on 2 Rollwin Road was exactly under the path of planes taking off. northeast/southwest 2,400' & west-northwest/east-southeast 2,100'. north of the runway intersection. and the manager was still listed as Raymond McNemar. depicted Rutherford Field as having a 2,100' unpaved runway. showing the 2 runways, 2 checkerboard-roofed hangars, and at least 8 light single-engine aircraft. 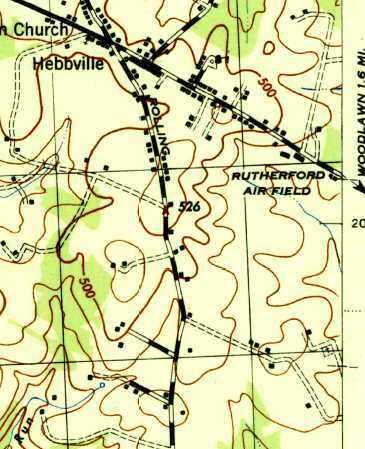 The 1953 USGS topo map depicted “Rutherford Airfield” as having a single unpaved northwest/southeast runway, with several buildings on the northwest side of the field. Rutherford Field was historic in that it was the birthplace of the Aviation Branch of the Maryland State Police. after being donated in 1954 by the Turnbull Enterprises Company (according to MD State Police Sgt Don Teesdale). 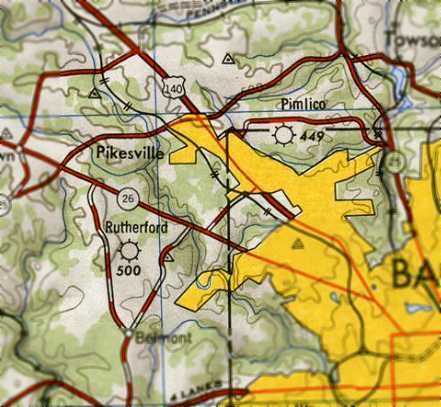 Rutherford was the closest airport to the State Police's headquarters, in nearby Pikesville. with activities that included flight instruction, repairs, and aircraft sales. The airport was described as increasingly popular with business representatives flying in & out of Baltimore. The McNemars said that they would like to expand the facility, but noted that adjacent farmland was now priced at residential levels. This rising land value was probably already a threat to the airport's future, but the tone of the article was highly optimistic." 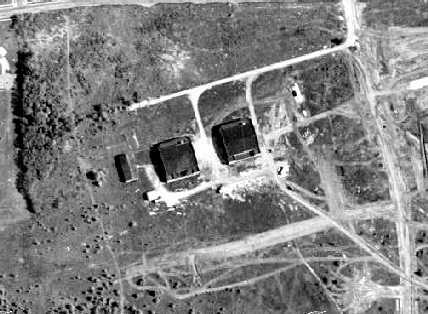 A 1957 aerial view depicted Rutherford Field as having 2 unpaved runways, with several hangars on the north side of the field. Over a dozen light aircraft were visible parked on the field. Bob Bloch recalled, “I learned to fly at Rutherford Field in 1958. 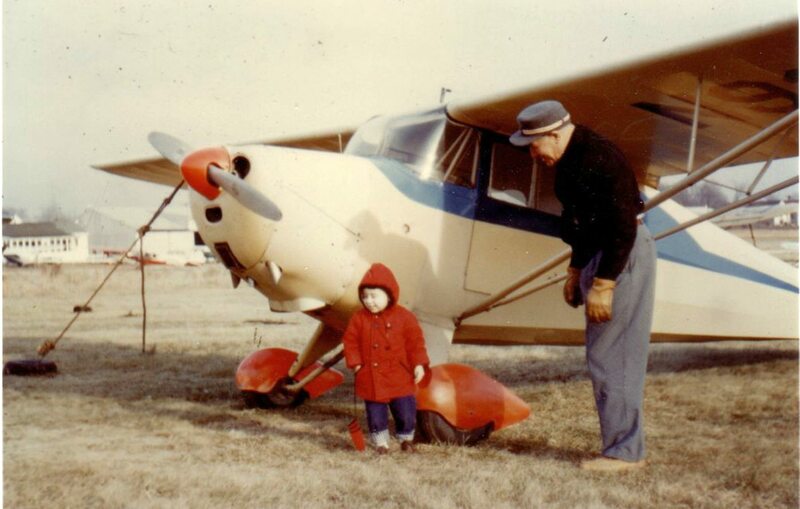 A 1959 photo by Bob Bloch of Howard Bloch & grandfather Sam Bloch alongside their Aeronca at Rutherford Field. Brooks Walker recalled, “I worked at Rutherford Field part time from 1959-63. During that time Rutherford Field was operated by United Flying Service. At that time Thelma McNamar & her step-son Charles McNamar operated the field. A 1960 photo by Brooks Walker, looking northeast at Rutherford Field. after just having taken off to the northwest. By 1960, the primary runway had apparently lost 300' of its length. 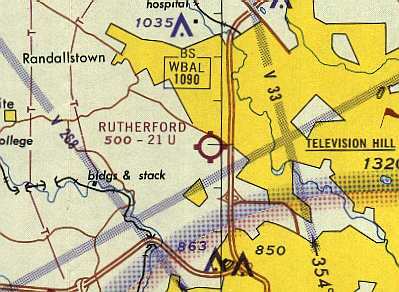 Rutherford was listed among active airports on the 1960 Washington Sectional Aeronautical Chart, with 2 turf runways (the longest being 2,100'). and let me have my hands on the controls, once in a J-3, the next time in a Tri-Pacer. Rutherford Field was listed among active airports in the 1962 AOPA Airport Directory, with the operator listed as United Flying Service Inc. It was described as having two 2,100' sod runways (5/23 & 15/33, which also had a 1,300' macadam portion). Brooks Walker recalled, “I joined the Navy early in 1964 & only returned to Rutherford once since then, I think later in 1964.
in which the northwest/southeast runway almost appeared to be paved. The crosswind runway still remained intact, but did not appear to be much-used. with a total of over 25 light aircraft visible parked on the field. Steve Hurtt recalled "having grown up in Rutherford Heights, the subdivision across Windsor Mill Rd from the airfield. and Rutherford was a neat place to buy a 6 cent, 6 ounce Coke, a Lance cracker, and watch the planes. As a young lad, the airport was a great hangout & I constantly begged Miss Mack for a job there. She always told me to come back when I was 16. I did & was hired as a lineboy! I worked there [starting in] 1964. Bruce Bowersock recalled, “I had Richard & Bobbie Green as instructors [at Rutherford Field]. soloed & was working towards my Private Pilot when they announced that the airport would be closed. That was in 1966 I think. When I started at Rutherford the rental airplanes were all Pipers: Colts & Tri-Pacers. The FBO (Mrs. Mack) then moved her operation to Friendship Airport where I finally completed my PPL in 1966 or 67. I believe that I met Senator Sarbanes at Rutherford (before he was a senator). I seem to remember that he was in a partnership that owned a Piper Comanche. Charlie Wood recalled, “I began my flying at Rutherford on 7/1/65. I owned a Tripacer, N3343A, which was a joy to fly. 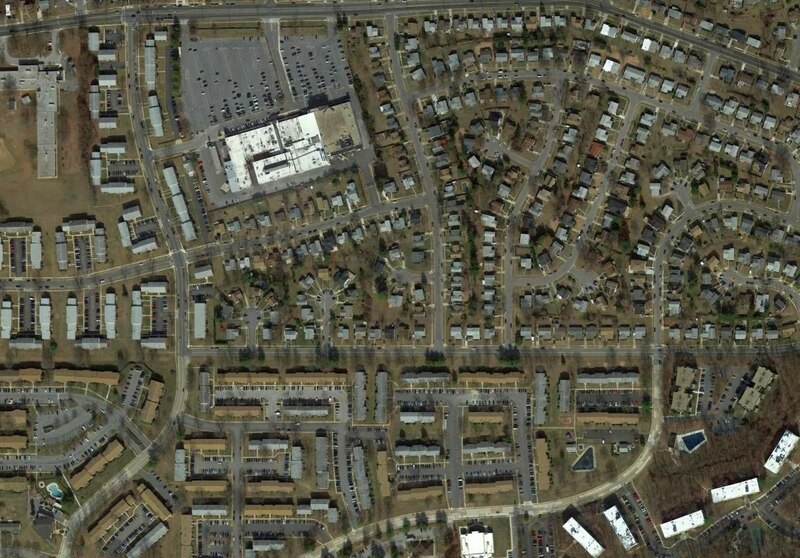 I was living in Glen Burnie at the time. My flight instructor at Rutherford was good, but he hated his job. he would be spending all of his hours in the right seat watching. Shortly after I left Rutherford, he did too, and he went to work in a greasy spoon restaurant. which meant I had to call ahead so they could pull it out for me by the time I arrived. to get as many as possible inside the protection of the hangar. That sun was brutal on the fabric covering of aircraft common in those days. Charlie continued, “I have many fond memories of Rutherford. I don't recall the main runway orientation, maybe 14/32. When using Runway 32, the 1st half was paved (macadam) and the 2nd half was gravel. The whole time I was there, almost a year, I never saw the crosswind runway used. Runway 14/32 offered its own excitement. On the approach to Runway 32 one had to fly over some power lines, marked with a couple of large orange balls to aid seeing them. Charlie continued, “I started my training 7/1/65 in the Piper Colt, the 2-passenger version of the Tripacer with a 108 hp engine (and no flaps). A 1966 photo by Charlie Wood looking northeast at the Rutherford Field office & hangar. with a 2,100' unpaved runway. in its last year of operation. Steve Hurtt recalled the he worked at Rutherford up "to the closing of the airfield in the Spring of 1966.
making the opening year of the field 1926." A 2013 photo by Steve Hurtt of an undated business card for United Flying Service Inc, Rutherford Airport. 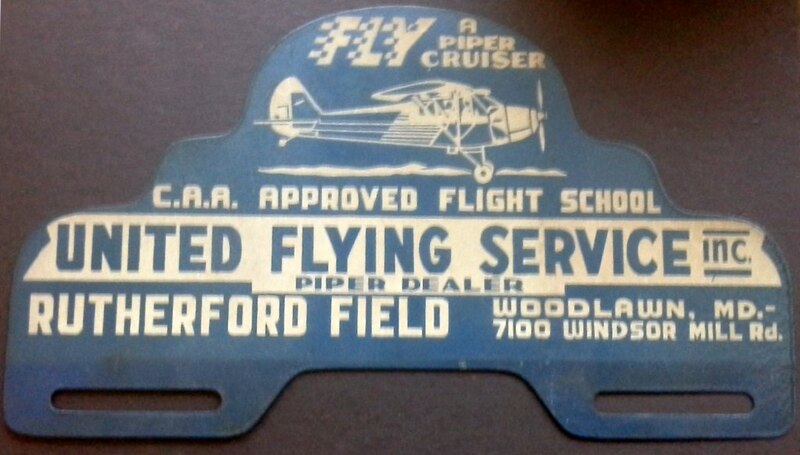 A 2013 photo by Steve Hurtt of an undated license plate frame card for United Flying Service Inc, Rutherford Field. Michael Turk reported that his great-grandfather, O.B. Rutherford, sold the land of the airport in the mid-1960s to developers. too valuable to continue to be used as a small general aviation airport. and the massive headquarters of the Social Security Administration was built a few miles to the southeast. 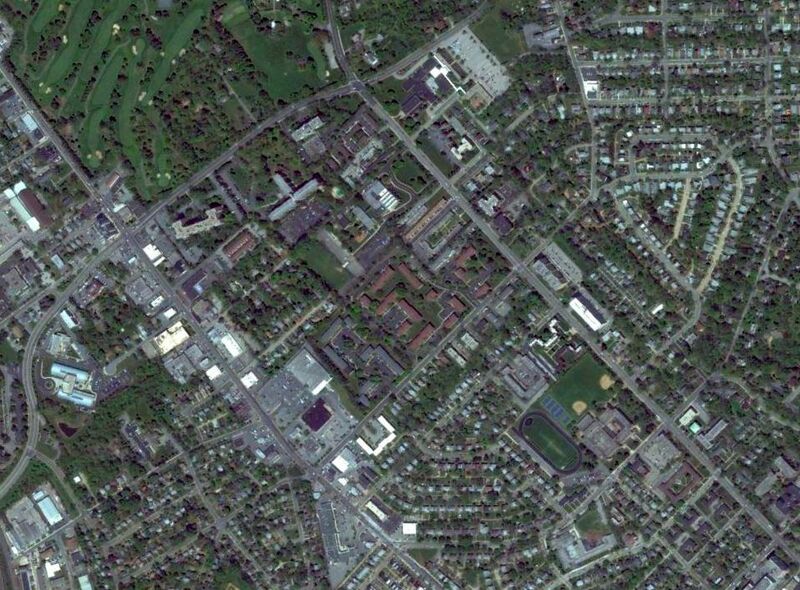 and undoubtedly hastened Rutherford Field's demise & conversion into more a more densely-built commercial property. Micheal Dolin recalled, “Rutherford Field... was the first field I landed at in Baltimore. It was closed when I touched down in the spring of 1967. In fact it was rumored that the police were watching for airplanes that wouldn't give up the field shortly after it closed. I must have landed my Taylorcraft long after anyone gave up looking for unauthorized airplanes landing. 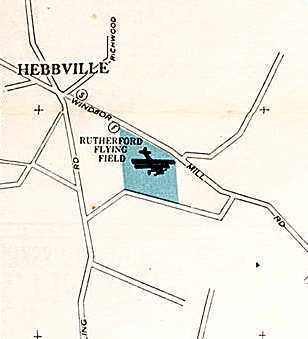 Rutherford Field was no longer listed among active airfields in the 1968 Flight Guide (courtesy of Robert Levittan). with all of the planes gone, and trucks (construction vehicles?) parked in their place. but one of the buildings along Windsor Mill Road had already been removed. By the time of the 1971 Washington Sectional Chart, Rutherford Field was no longer depicted at all. David Pipes said, "The land stood vacant until the late 1970s. At that point, the area began to be developed, and I recall that by 1980 very little open land was left in that area." 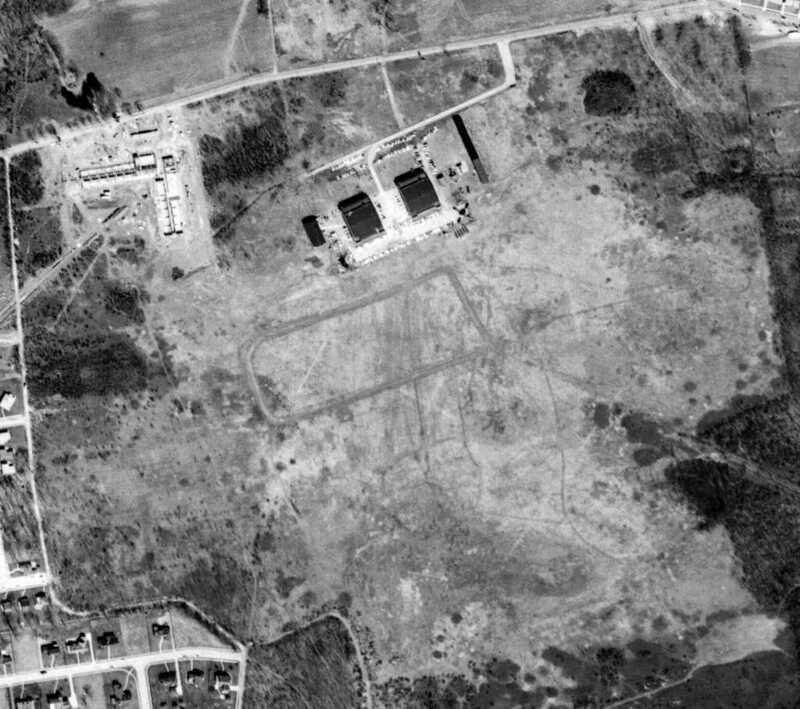 A 1993 aerial photo showed no trace remaining of Rutherford Field. Art Downs observed, “I felt a strong sense of sorrow when the field was no longer there. 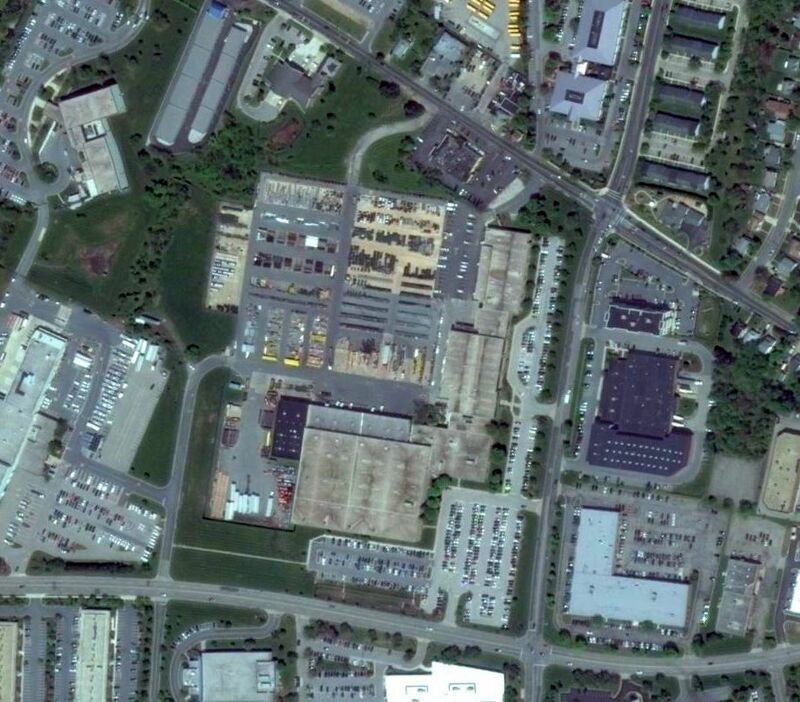 A 2015 aerial photo shows Rutherford Field lives on in name only, as the Rutherford Business Park, an office park. No trace remains of the airport. The site of Rutherford Field is located southwest of the intersection of the Baltimore Beltway (695) & Windsor Mill Road.